A newly detected house-sized asteroid, designated 2018 VX5, flew by the Earth on Wednesday, November 14, at around 4:37 UTC. The space rock passed by our planet with a relative velocity of about 8.3 km/s, at a safe distance of approximately 3.6 lunar distances (LD), what corresponds to 1.38 million kilometers. 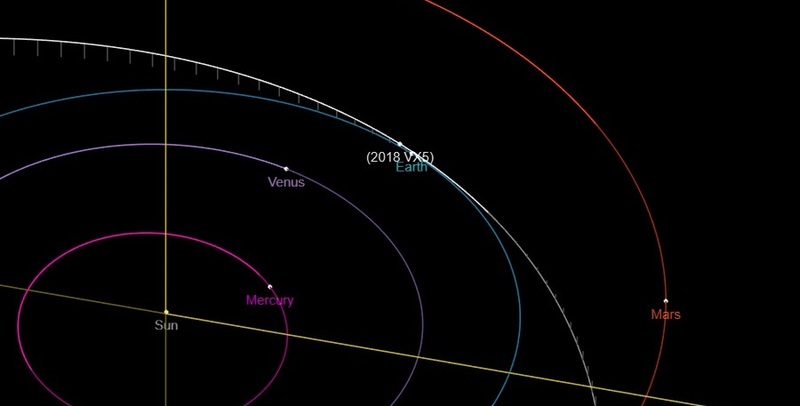 2018 VX5 is an Apollo-type asteroid first observed on November 8 by the Pan-STARRS 2 (PS2) telescope at the summit of Haleakala on the Hawaiian island of Maui. The Panoramic Survey Telescope and Rapid Response System (Pan-STARRS) is an astronomical survey consisting of astronomical cameras, telescopes and a computing facility, surveying the sky for moving objects on a continual basis. According to observations, 2018 VX5 has an estimated diameter between 14 and 43 meters. It has an absolute magnitude of 25.7, a semimajor axis of 2.46 AU and orbits the sun every 1,411 days (3.86 years). Besides the fly-by of Earth, 2018 VX5 also made a close approach to the Moon on Tuesday, November 13, around 19:19 UTC, at a distance of about 3.44 LD (1.32 million kilometers). No future fly-bys of this asteroid to our planet are currently predicted by astronomers. To date, astronomers have discovered more than 19,100 near-Earth objects (NEOs). Only this month 133 such objects were detected. On November 14, there were almost 2,000 Potentially Hazardous Asteroids (PHAs) detected and none of them is on a collision course with our planet. PHAs are asteroids larger than 330 feet (100 meters) that can come closer to Earth than 19.5 LD (7.5 million kilometers).